When Audi revealed the B7 RS4 in 2006, few other cars were able to match its mix of practicality and raw pace. And suddenly, the E46 M3, with its considerably less powerful straight-six, seemed a little weak compared to Audi’s V8 brute. That was quite a while ago, though, and the relentless pace of automotive progress means the B7 isn’t quite the heavy hitter it once was. So could it really be given a run for its money when drag-raced against the current S3 saloon? It’s the B7 baby brother in more ways than one. Not only is it a size down from the RS4, but it’s also just a mere ‘S’ model. Its 2.0-litre engine has less than half the displacement and half the cylinder count of the RS4’s V8, and with 306bhp, it has a power deficit of over 100bhp. 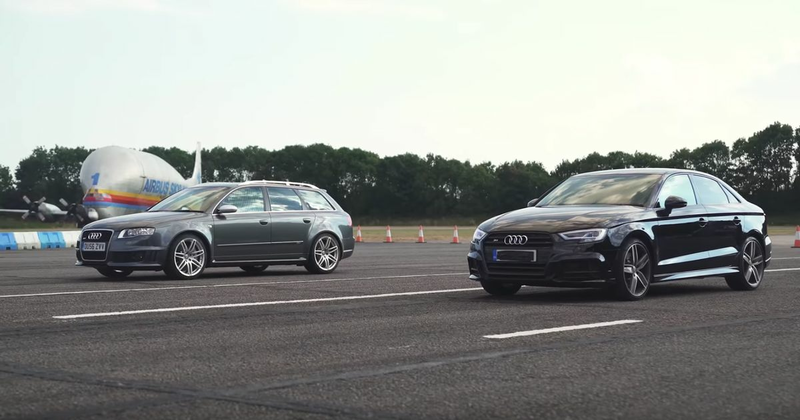 While the RS4 has a conventional six-speed manual, though, the S3’s turbocharged engine feeds its power to the wheels via a slick seven-speed dual-clutch gearbox. It has a launch control function, and it’s around 150kg lighter than its older, bigger brother. Suddenly, this is looking like a very interesting drag race.